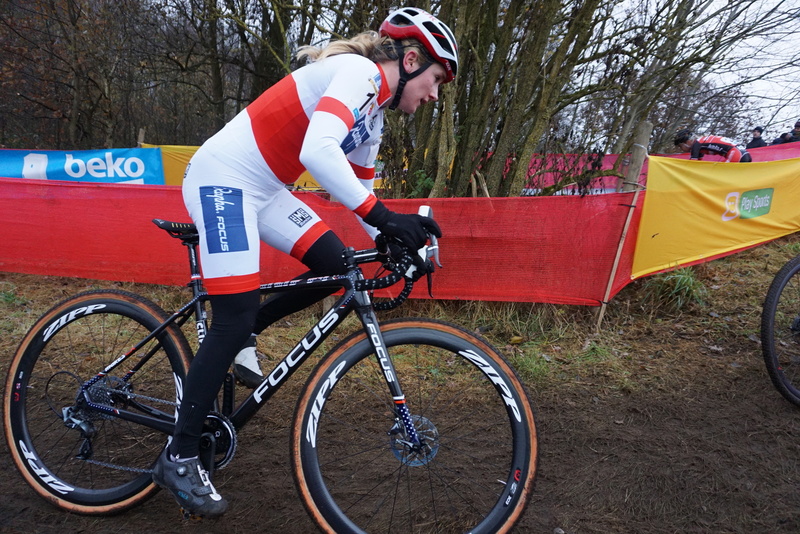 Last weekend in Hoogerheide, Ellen cemented her overall U23 World Cup Series win, took 39th, and prepared for the week ahead, at Luxembourg’s World Championship race. “Hoogerheide wasn’t the race I was hoping for, but I’m feeling great with a little more rest this week, to head into this weekend,” Ellen explains. The fast track at the Dutch race made the groups large, and drafting became an important element of the incredibly speedy race. 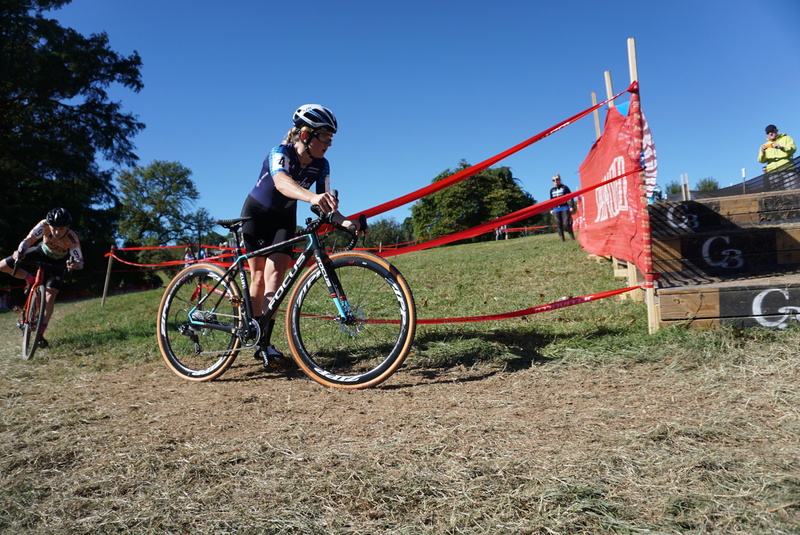 In addition to the U23 overall series win, she finished sixth in the overall for Elite Women, an impressive endeavor, especially for a 21-year-old. 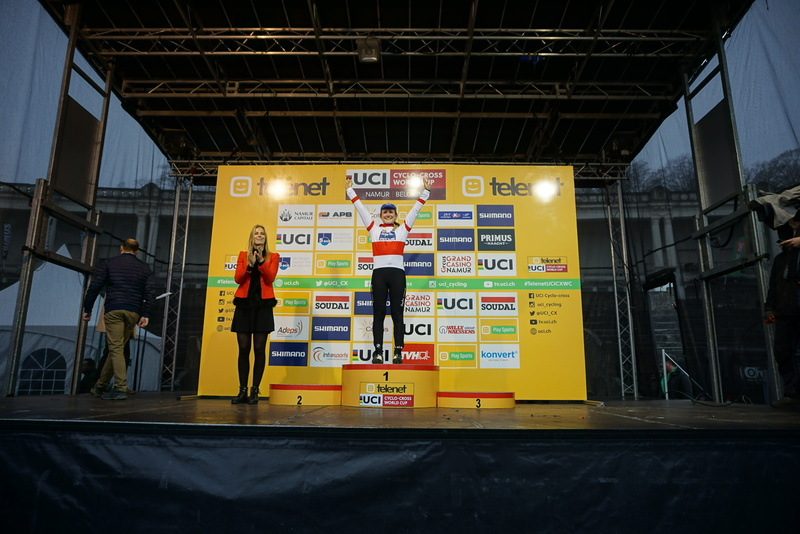 “I’m really excited to have won the U23 overall. It was especially exciting because it’s the first year the UCI has had this category so it meant a lot to win it. I’m so thankful to my team and everyone who helped me get here,” she added. The Aspire Racing team heads to Hoogerheide tomorrow, and make sure you follow Ellen’s race on Saturday at 1:30 PM CET. 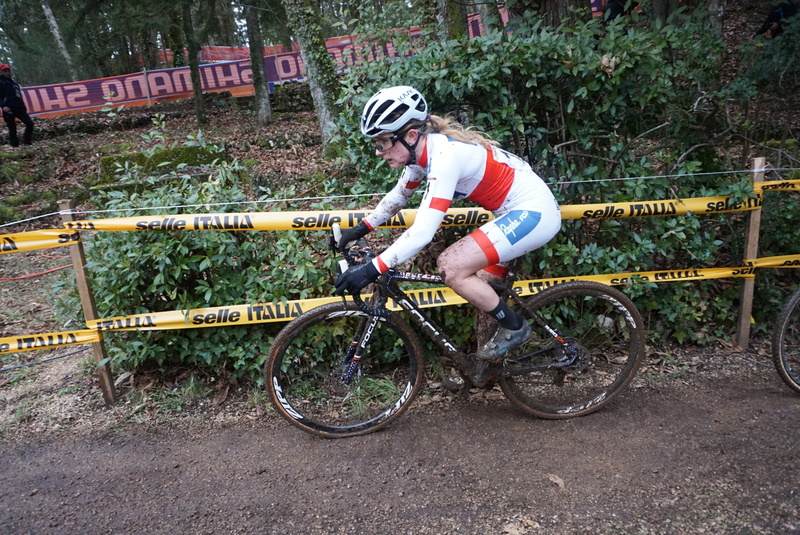 This weekend, Ellen raced near Rome in Fiuggi, Italy at the penultimate round of World Cups for the year. 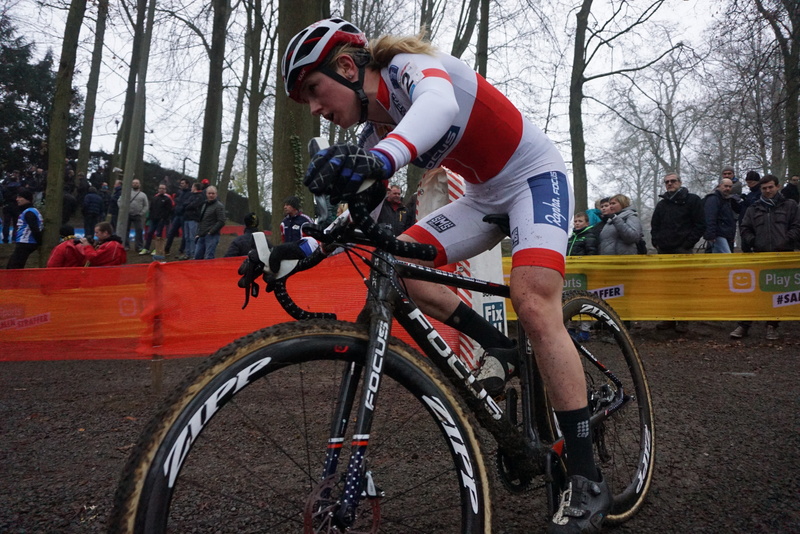 She finished strong in eighth place, which propelled her into fifth in the World Cup overall while extending her U23 women’s lead in the series. “Fiuggi was one of the most fun, yet also challenging races I have ever done. 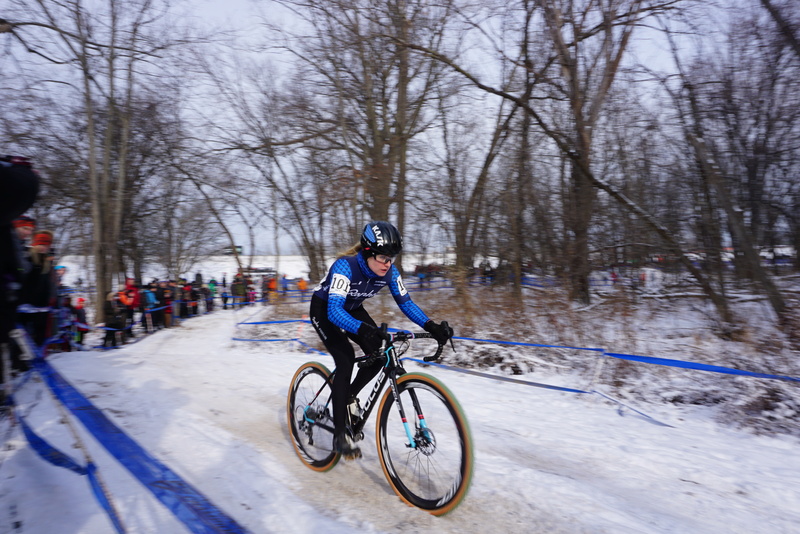 The slick, frozen course made for an unpredictable and exciting race,” she says. “All in all, it was a great day and I’m really happy with my racing and how well the team worked under a lot of pressure!” she concludes. 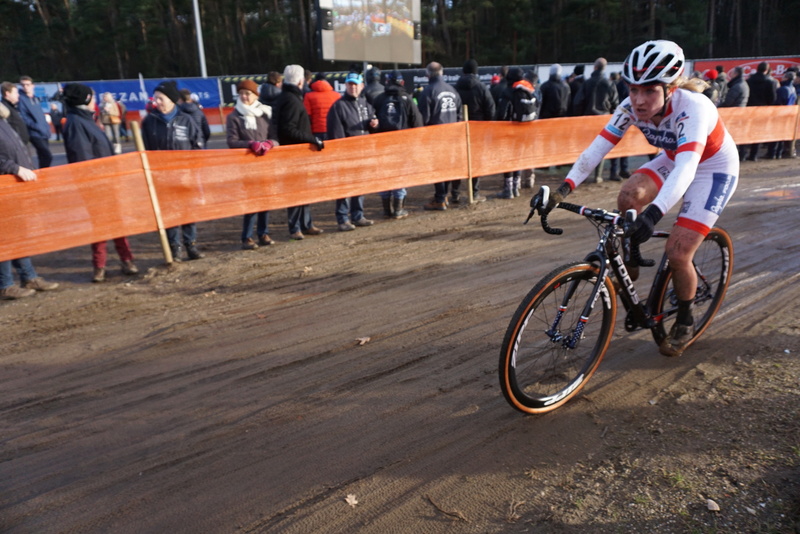 Next up, the team is heading to Hoogerheide for the last World Cup, where Ellen will defend her U23 title. The Aspire Racing team had a great time racing in a practically hometown venue for National Championships in Hartford, under an hour from their homes in Easthampton. 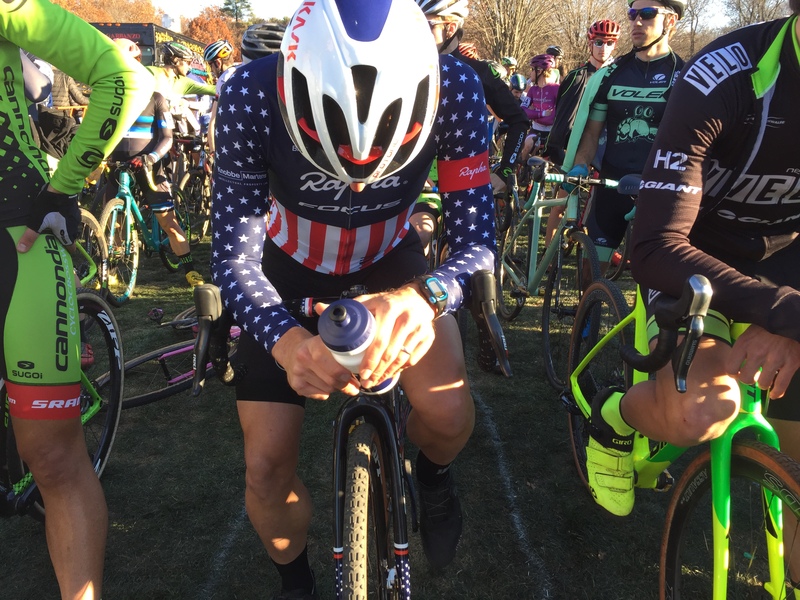 Ellen retained her U23 Women’s National Championship title, while teammate Jeremy Powers’ race was marred with an early crash that landed him in 24th place. A flawless race from start to finish had Ellen establishing a gap by the end of the first lap, and growing it as the race wore on. Jeremy Powers had a rough day at Nationals. “A big thank you to everyone who came out and supported our team this weekend!” Jeremy concluded. Stay tuned to see how the last round of European racing for the season goes. 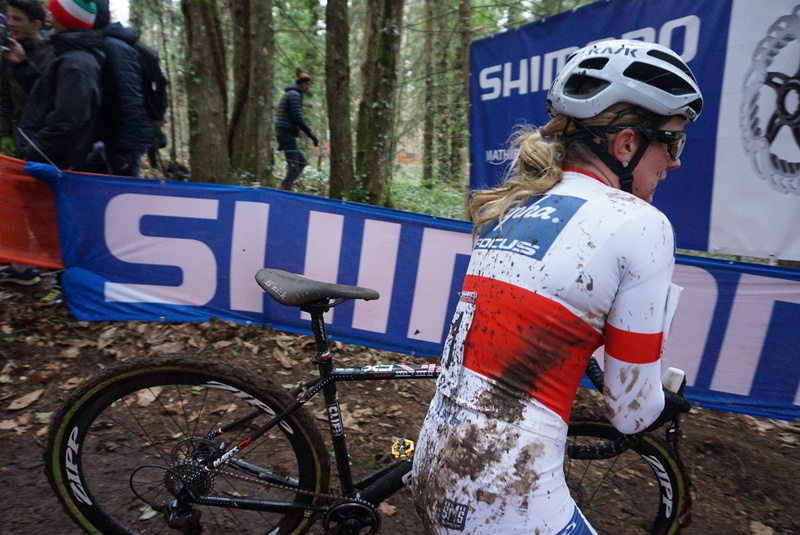 The Christmas week of racing in Europe has come to an end for Aspire Racing’s Ellen Noble, after two weekends of World Cups, first in Namur and yesterday, in Zolder (host to last January’s World Championship race). Ellen had a great start at Zolder—with a front row starting position—and a strong first three laps of racing in the lead groups as race favorites including Ellen Van Loy, Sanne Cant, Sophie De Boer, Katerina Nash and a recently-returned Marianne Vos battled for position. Ellen’s strong start and comfortable position remained until halfway through the race. 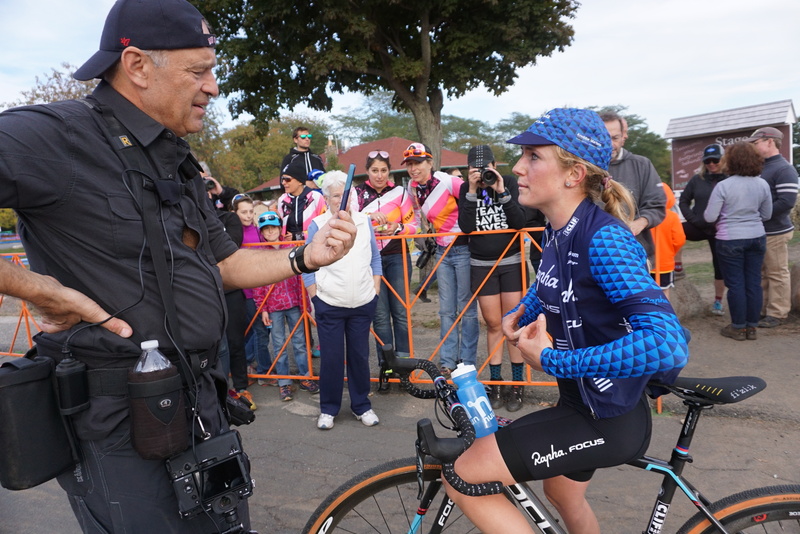 “Unfortunately, at the end of the third lap, I suffered a mechanical that lost me some serious time,” she says. But she managed to work her way back up to a 19th place finish. On January 8th, Ellen will be racing for another National title, so make sure to follow along! 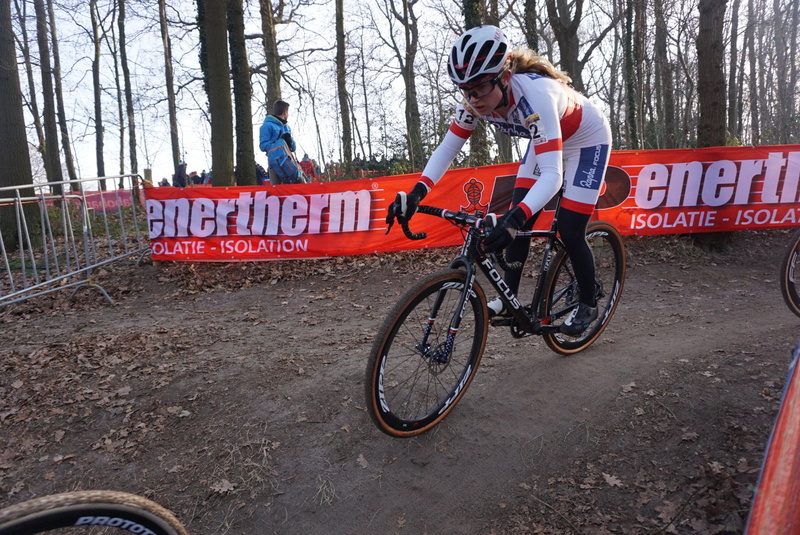 This weekend, Ellen raced to 16th place at the World Cup at the Citadel of Namur in Belgium. The start line was stacked with top racers, from eventual winner Katarina Nash to current World Cup Overall leader Sophie de Boer, plus several American racers including Ellen. The result also extended Ellen’s U23 Series lead. 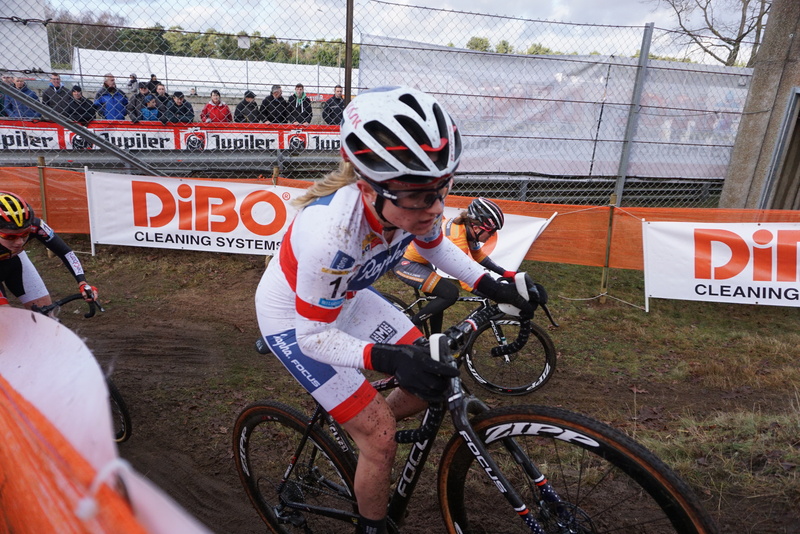 Next weekend, Ellen heads to Zolder for another round of World Cup racing. 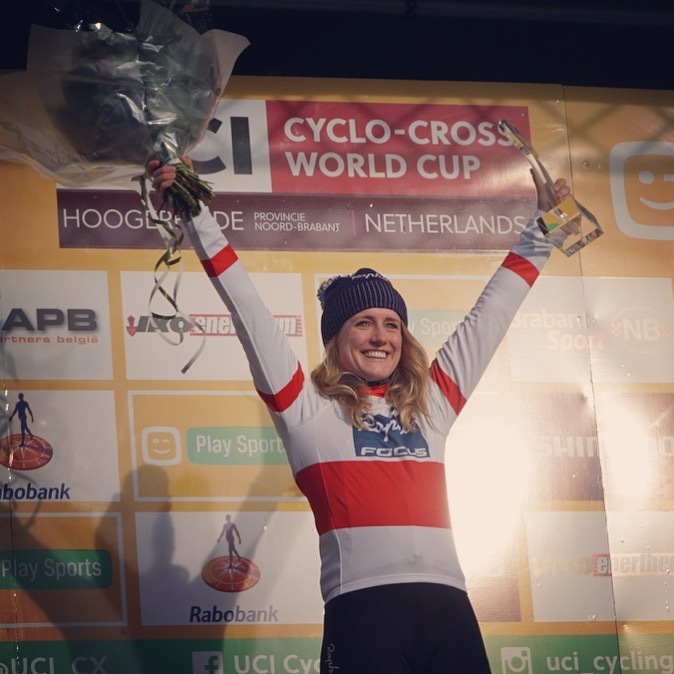 After a disappointing World Cup cancellation at Koksijde due to wind, Ellen and Jeremy headed to Zeven in Germany for the most recent round of World Cup racing. The weekend didn’t disappoint, with chilly temperatures and an interesting course. 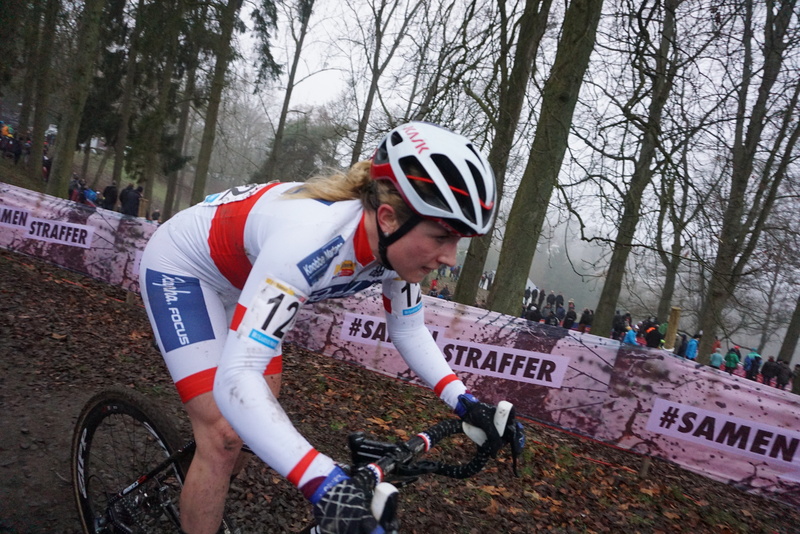 Ellen took 10th place in the Elite Women’s race, and retained her U23 Women’s Overall lead in the World Cup series. Jeremy finished in 47th. “This weekend was yet another amazing weekend of action-packed European racing,” Ellen says. 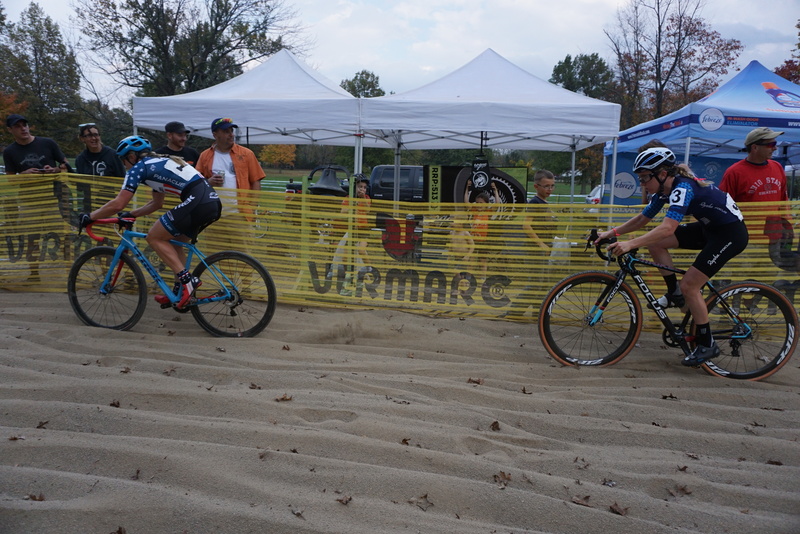 “While both courses were surprisingly dry, compared to other courses that I’ve raced on, they were both extremely technical and favored a good starter and technical rider. On Saturday at the Zeven World Cup, I had a great start and maintained that position through the first lap. Unfortunately a bump-in with another rider lost my contact on the lead group, but I still managed to place 10th, which is an exciting result and I am happy with my consistency. The next day, the winners of the Zeven World Cup—Sanne Cant and Mathieu Van Der Poel—repeated their wins in Belgium. 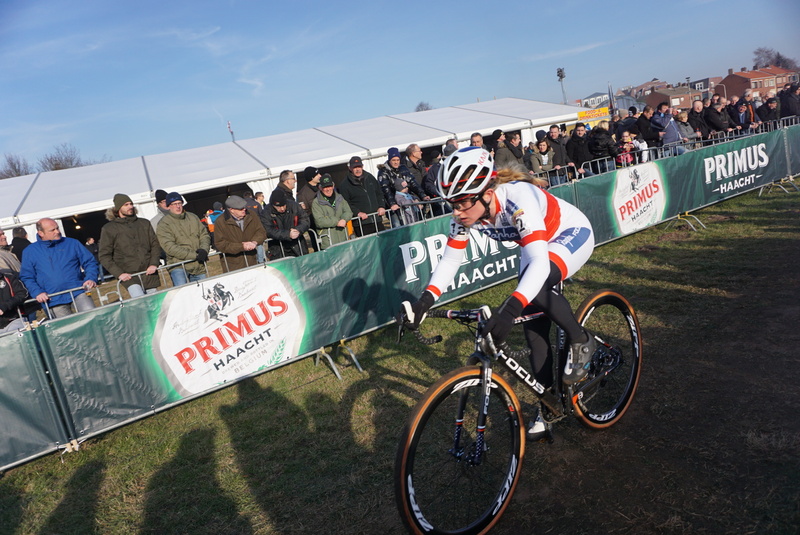 Jeremy and Ellen also raced at Hamme in Belgium for Flandriencross, where Ellen finished 15 in the UCI C1 race and Jeremy finished in 23rd. After a long journey home, the Aspire Racing team is ready to rest up and prepare for the next big block of racing ahead of Nationals! 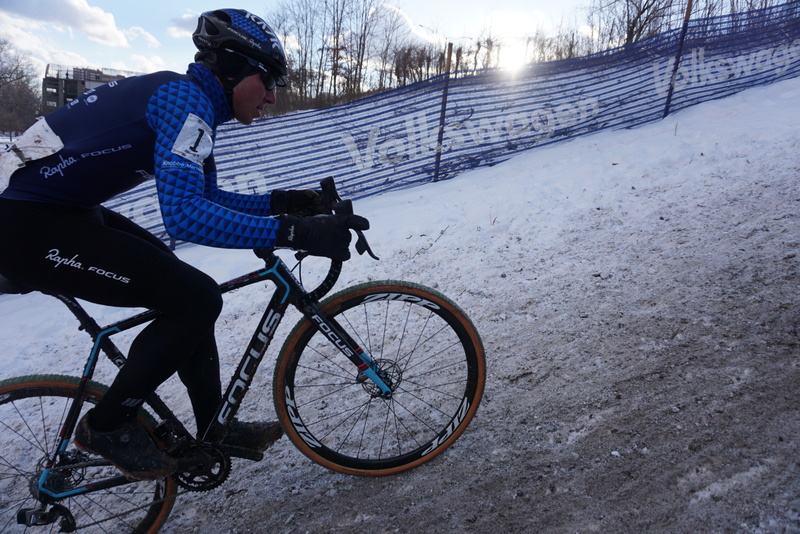 Cycle-Smart International has been happening in Aspire Racing’s hometown for 26 years now, and the iconic NoHoCX race, as it’s now referred to, is one that the team all too often is forced to miss. But this year, the crew was home for the weekend and able to toe the line for two days of fast, fun UCI racing just minutes from home. Both days, Ellen found herself in the lead group with Maghalie Rochette, Emma White and Crystal Anthony. Saturday’s race found the four riding together until Maghalie and Emma attacked and rode away, with Maghalie eventually taking the win. Sunday’s race played out similarly, but Ellen was in great racing form, and she and Emma were the two to take off midway through the race. Emma eventually finished with the win, but the battle was fierce. 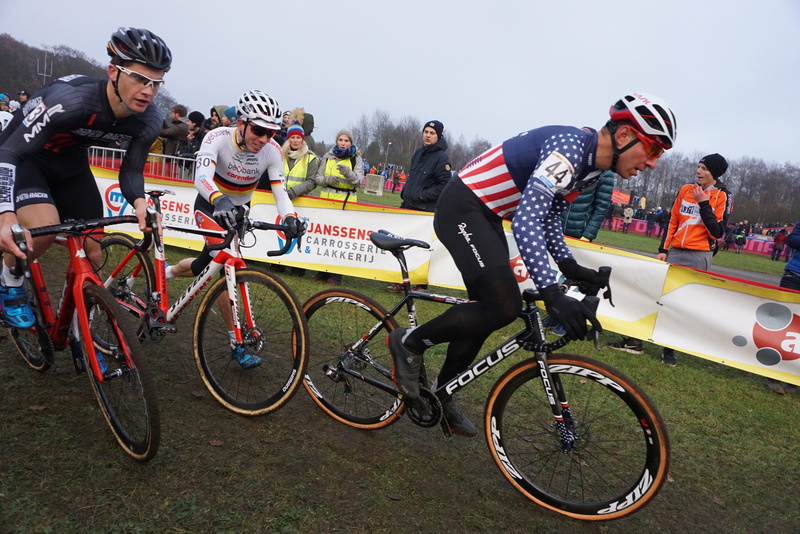 “It’s such a great atmosphere and group of people, which made it a highly enjoyable weekend with friends and family 15 minutes from home,” Ellen’s teammate Jeremy Powers adds. Saturday’s race played out tougher than he anticipated, thanks to a busy week and a fast group of racers on the front for the bulk of the race. 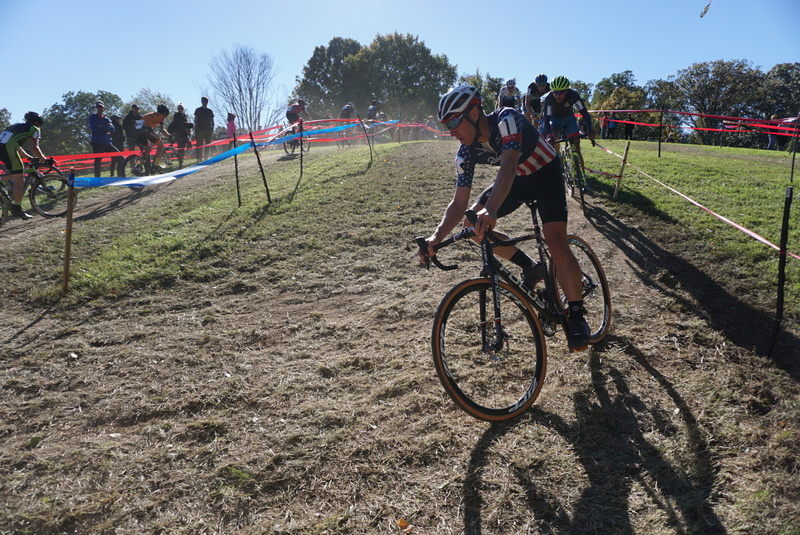 Jeremy sat in the lead group for most of the race, until Curtis White attacked off the front about two-thirds into the hour of racing, and Jeremy worked with Jeremy Durrin and newcomer and JAM Fund rider Jack Kisseberth to chase back on. “With sponsor commitments on Wednesday and Thursday last week in NYC, I felt a bit off on Saturday and didn’t quite have a the snap I wanted for the race,” he explains, and he finished in fourth place. Jeremy surprised the crowds by lining up for Sunday’s race as well, and he spent the race dueling with Curtis White. “Sunday, I felt good racing from the front for a majority of the day and ended up missing the win in the sprint finish with Curtis White,” he explains. Aspire Racing heads to Europe tomorrow for Koksijde and Zeven World Cups so stay tuned for updates! Ellen’s weekend went great—on Saturday, she took her second victory for the second year in a row at the Pan American Championships for U23 women, and on Sunday, she was third in the C1 Elite Women’s race behind racing legends Katerina Nash and Katie Compton. For Jeremy Powers, Ellen’s teammate on Aspire Racing, the weekend signaled a return to racing after injury. 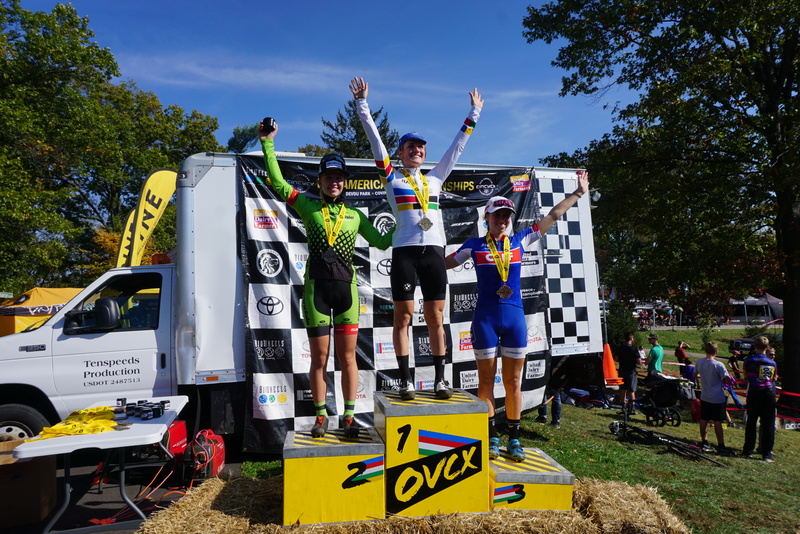 After a hard-fought race at Devou Park near Cincinnati this weekend, Jeremy took second in the Pan-American Championships race, conceding his title to JAM Fund graduate Stephen Hyde. Sunday was a more challenging day for Jeremy, and despite leading the race and spending the first 40 minutes in the lead group, he ended up in ninth place. Still, the weekend showed that he’s recovering from injury and ready to come back to racing with a vengeance. 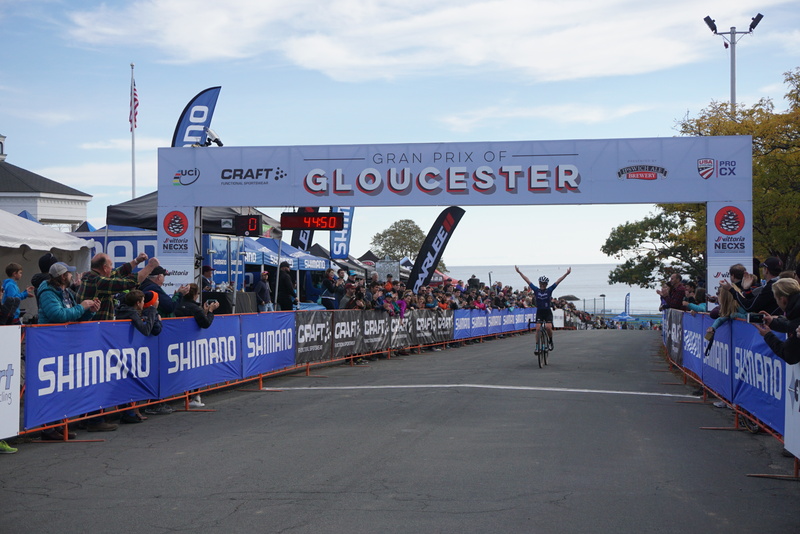 The Gloucester Gran Prix of Cyclocross is one of the most iconic cyclocross races in America, and Jeremy and Ellen were on the start line on Saturday for Day 1 of racing action. 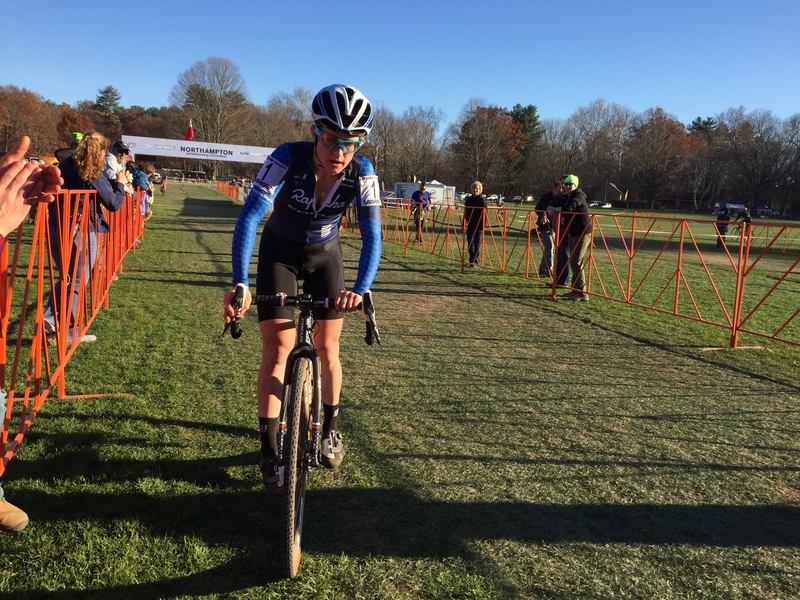 Ellen took home a win after dueling with Helen Wyman and Emma White earlier in the race before riding off the front and soloing to a win with two laps to go. Jeremy finished 13th in the Elite Men’s race. The Aspire Racing team headed down to Baltimore, Maryland, for the C1 race on Day 2 of CHarm City Cyclocross in the iconic Druid Hill Park. The racing on Sunday was dry, sunny, and fast—and the spectators (and hecklers) were out in full force. 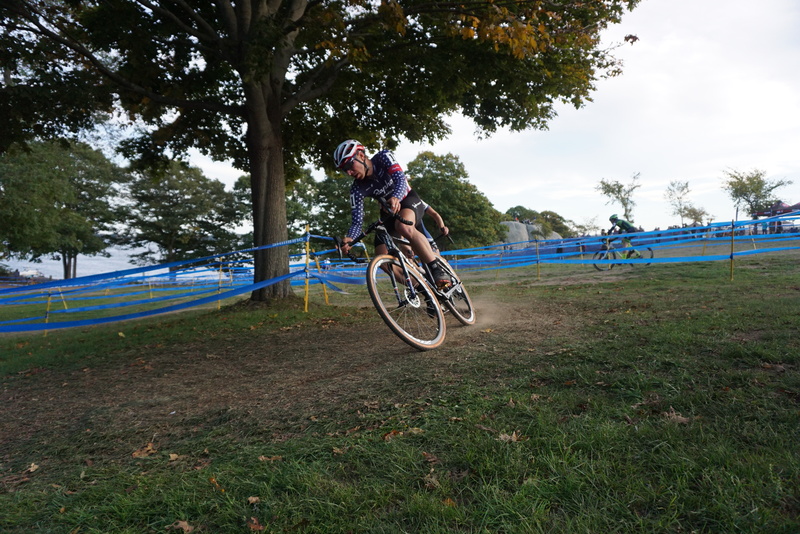 Ellen finished in ninth in the women’s race after taking the holeshot and leading for the first lap of the race. “Charm City was a disappointing race for me, with some breathing issues playing a big role in how I felt,” she said. 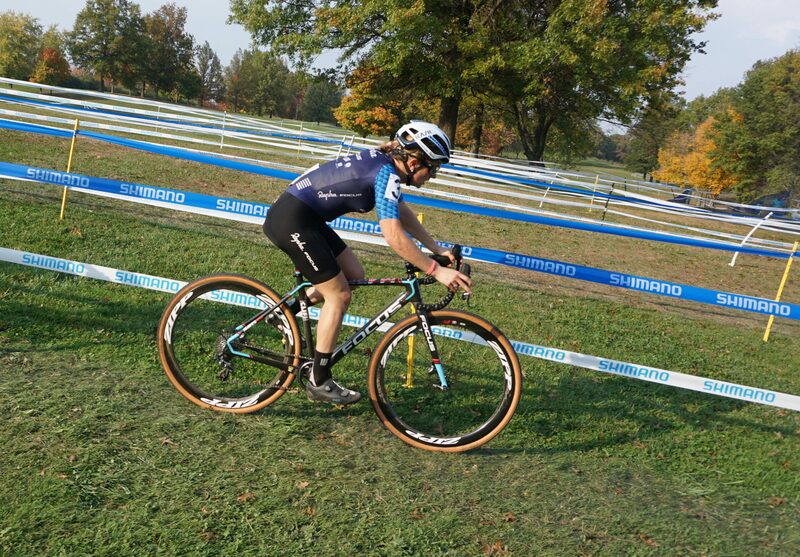 The team was indeed back together now that Jeremy has recovered from his crash at Trek CXC earlier in the season, and his form is coming on as he finished second to Stephen Hyde in a long battle with a large lead group until the last lap and a half of the race.